The USB-C to USB 3.0 Premium Mini Adapter lets you connect your USB devices including a smartphone, tablet, mouse, or keyboard to a new MacBook® or USB-C ready computer. 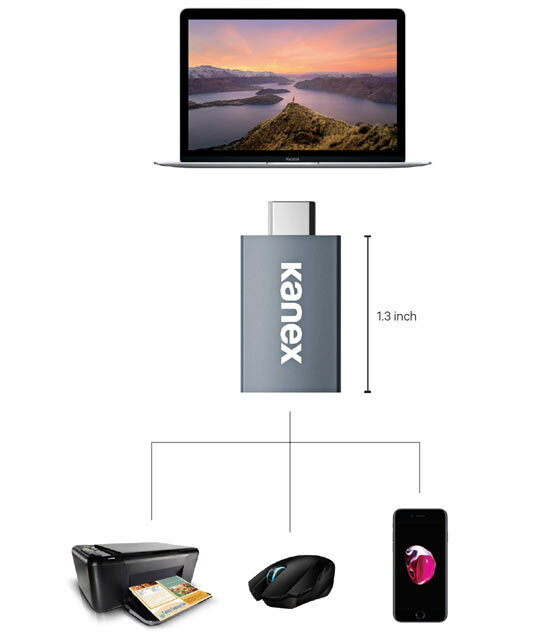 The Kanex USB-C to USB 3.0 Premium Mini Adapter lets you connect your USB devices – like your iPhone charging cable, hard drive or printer - to a USB-C MacBook. Continue to use your current USB devices with your new USB-C enabled computer. The USB-C to USB 3.0 Premium Mini Adapter is our smallest adapter ever. You can set it and forget it. It’s ultra-portable, making it an ideal travel companion. The premium metallic brushed aluminum finish matches perfectly with your MacBook. Now you can access information from your USB 3.0 hard drives and other devices. This little adapter is backwards compatible with USB 2.0 and USB 1.1. Product Dimensions: (W x H x L) 0.54 in. x 0.28 in. x 1.13 in. Product Weight: 0.1 oz. / 0.006 lbs. Packaging Dimensions: (W x H x L) 3.91 in. x 5.08 in. x 0.90 in. Packaging Weight: 1.3 oz. / 0.08 lbs.